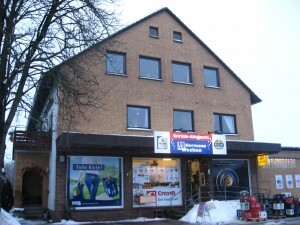 The picture on the right is, ladies and gentlemen, the only store located in my really good friend’s village, which is located about 20-30 minutes outside of Hannover. She attends university in Osnabrück, which is why I posted a couple of the pictures I took of the small city in my last post. This particular Christmas was extremely eventful. As I mentioned in my last post, Christmas isn’t exactly on the priority list for Buddhists, even though we’re like the Christians who only go to church for Christmas and Easter (my family and I only go to temple for Lunar New Year). My family and I celebrated Christmas diligently for about the first 13 years of my life in the traditional sense: awesome dinner, awesome tree, awesome decorations, awesome Christmas lights, awesome Christmas songs (Alvin & the Chipmunks’ version of Christmas songs was always blasting in the background of our house for a month straight) and last but not least, the coolest presents ever. After those lovely 13 or so years, we spent every Christmas with my Mom’s best friend who lives in Oregon. Tax-free-after-Christmas shopping, anyone? Christmases during the past few years (minus Munich, of course!) have actually been quite boring for me. While all my friends had to attend their obligated dinners and spend time with their families, I sat at home absolutely bored. Hence, why I love spending Christmas in Germany. Don’t get me wrong: family time is something I dearly value as a self-professed homebody. But based on my family’s mentality on Christmas, being home for Christmas did not and will probably never really bother me. As long as I’m with loved ones in the form of friends or family somewhere in the world, I don’t feel the need to feel lonely on Christmas. My friend, J, and I have been friends since my junior year of high school, when she was an exchange student staying at my house for about a little over 2 weeks. My siblings and I spent three nights with her family shortly after my siblings’ arrival. During those four days, we took a day trip to Osnabrück and Wolfsburg. J showed us her apartment in Osnabrück and also showed us around the small city. The picture above is a glimpse of the small downtown area (this part was the Old Town). Wolfsburg was really fun because we only went there for the science museum, Phaeno. This museum was enormous and we were all thoroughly pooped by the end of it. I think we spent about 4 hours in the museum playing with most of the models. You could spend three, straight days in there just reading all of the explanations and facts about each model. Science science science! 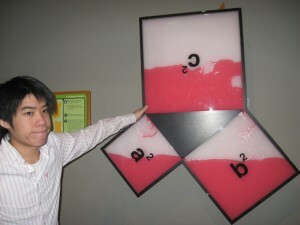 Even though I wasn’t a science major, I absolutely lovvveee science! I played the lazy visitor and got away with not having to read much because my brother had learned a great deal about most of the concepts associated with each model. I just tagged along as he pointed out what each model illustrated and offered some other examples that I could relate to. Hoorah for smart siblings! 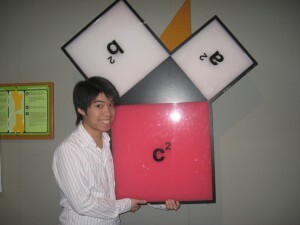 I just have to add these pictures of my brother with this model because as a visual learner, I squealed out of happiness at seeing this mathematical concept presented in such a witty way. P.S. I think I’m falling in love with Northern Germany too. 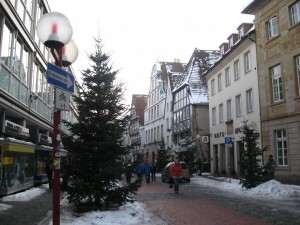 This entry was posted in Jill Nguyen '10, Fulbright to Germany and tagged Christmas Break, Hannover, Osnabrück, Phaeno, Wolfsburg. Bookmark the permalink.